Blue is my favorite color. The beauty of a pristine azure blue sky brings happiness to my heart and a smile to my face. My bedroom is even painted a peaceful blue hue. This summer I spent a few days traveling to 4 national parks in Colorado and Utah. The weather was perfect with gorgeous blue skies and hot days. Everyday when I awoke to clear blue skies, I was ready for another adventure. I was able to share these few days with a very dear friend and 2 of her children. The Arches National Park had amazing rock formations. 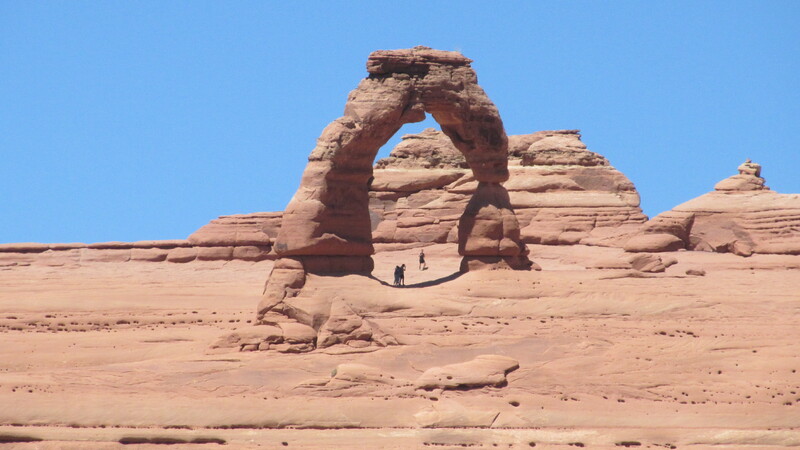 The most recognizable is Delicate Arch which we saw standing against a bright blue sky. It is beautiful! We had a great time experiencing God’s natural creations. A friends of mine is Clayton Brewer a poet. I visited Clayton at his assisted living home and asked him to write a poem about the color blue. He dictated and I wrote down his sweet words about God’s love. Other skies of grey we often do dread. Not always seen in the skies above. With various shades of aqua blue and even more. Knowing God’s love is majestically true. Shades of blue to believers eyes. His grace to us is always new. Writers have written and singers sing. God’s love and how He is so wonderfully kind. Notice the blue and you’ll understand why. Look to the sky and you will see His face.